How will you get to the top of the career ladder? These days, it takes more than a qualification alone to land that dream job. Between drive, passion, hard work and experience, there are several factors that top recruiters look for. These days, it takes more than a qualification alone to land that dream job. Between drive, passion, hard work and experience, there are several factors that top recruiters look for. In the end, you’ll either be the chosen one or overlooked for someone better suited. There’s a definite way to stand out. All you need to do is seize the right opportunities and learn from the right people. At The Business School, a division of Varsity College, an educational brand of The Independent Institute of Education (The IIE), we happen to believe that what you know is equally as important as who you know. 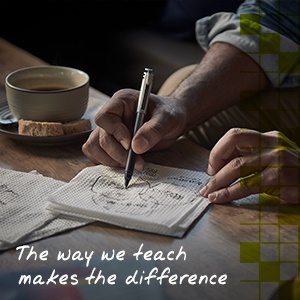 So, we hand pick our lecturers to ensure that the way we teach makes the difference. We rely on the finest educators that are qualified in their field. With invaluable working world intel on their side, our lecturers provide a realistic overview of your chosen industry, equipping you with the best skills to climb that career ladder. To our lecturers, there’s no better use for some of their free time than helping our students learn. Whether it’s a question you might have or even a concept you haven’t mastered as yet, they’re always on standby to help when you need it most. With extra assistance, you’ll be proficient in the programme material in no time at all. One of the things our educators love most is getting to know what makes every student tick. In doing so, the lecturers at The Business School can tailor the way they teach in order to reach you in the way that you learn best. As an added bonus, you’ll get the one-on-one support that amounts to exceptional results. Working full time or can’t attend lecturers during the day? No to worry, we’ve got a range of IIE part-time Short Learning Programmes, Online and Distance options geared towards those who are already employed. This means there’s no excuse not to advance your skills. In fact, you’ll find that The Business School already caters to a range of ambitious young professionals just like you. Not only is this a great way to meet like-minded people, it’s also an ideal opportunity to network. From deciding to study further to what you study and even who you choose to study with, the right choices make all the difference. At The Business School, we offer the stepping stones and the mentors that lead to greater things. Looking for a job in a new industry? Perhaps you’re hoping to move up the ranks in your existing one? Either way, our IIE programmes are for professionals wanting to expand their knowledge and skills in a way that gets them noticed.